Order a family photo album from bonusprint and receive tailored albums that allow you to revisit your cherished moments for years to come. Get started right away and create your own family photo album! Creating a family photo album is a fun way of capturing precious moments that unfold as the years go by. With family photo albums, you can instantly relive every important moment from a new baby’s arrival through family holidays and on to big occasions like graduations and weddings. At bonusprint, we guide you through every step of the way as you create stylish family photo albums to share with your children or give as gifts to friends and family. There’s no better way to surprise a proud mum than with a Mother’s Day photo book. Children grow up so quickly but with her Mother’s Day photo album, mum can look back on special moments whenever she likes. bonusprint has lots of great ideas to help you create a luxury photo album for Mother’s Day. Start making your Mother’s Day photo album now with selecting favourite pictures from your laptop or mobile device. Holiday fun on the beach, exciting football matches or the thrills and spills of theme parks – these are just some of the moments dads will love reliving when they receive their Father’s Day photo album. With bonusprint, it’s so easy to create a Father’s Day memory book, simply choose your favourite photos from Instagram, Dropbox or Facebook and create a personalised album with just a few clicks. You can start creating your photo album for Father’s Day by using the bonusprint auto fill feature or have fun customising your Father’s Day photo book exactly as you like. Grandparents love nothing more than showing off pictures of their grandchildren so gather their favourite snapshots together and create a grandparents’ photo album. Small photo books that slip into a handbag are ideal for a grandmother’s photo book or create a luxury album with glossy pages and give grandad a photo album for his birthday. Christmas is another perfect time to make a grandparents’ photo album, giving them the opportunity to see their precious grandchildren grow and develop. There’s no time like the present to print a family photo album. Browse our bonusprint pages for inspiration and import photos from your laptop or mobile device and you’re ready to print a Mother’s Day photo album or to create a Father’s Day photo book. At bonusprint, we have lots of styles to choose from and many ways of customising your family photo album. Once you’ve bought your family photo album, you can share an online version with your family and friends at no extra cost! Choose a soft or hard cover Mother’s Day photo album and finish the design with a special loving message or a picture that wows. 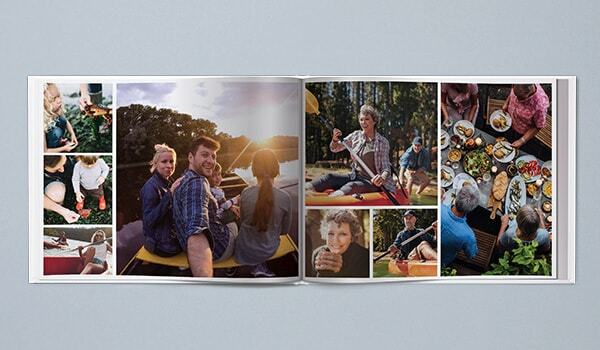 Or, why not drag, drop and tap to order a Father’s Day photo book in just a few minutes? Before you head to checkout have fun adding special effects and filters to customise your family photo album. Once you finish creating and buy a family photo album from bonusprint it will be on your doorstep within just a couple of working days.